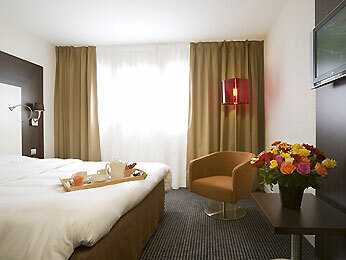 The 4-star Mercure Paris Porte d’Orléans hotel provides comfortable, spacious and air-conditioned rooms with modern decor. The hotel offers comfort and tranquility in a warm and friendly setting, perfect for family getaways or business trips. From this ideal location, you can fully enjoy the capital and the nearby neighborhoods of Saint-Germain-des-Près and Montparnasse. The Mercure Paris Porte d’Orléans and its staff have gained a lot of experience with arranging meetings, conferences, trainings and all sorts of events. Offering conference facilities including 6 meeting rooms the hotel has been used as a conference hotel in Paris on a regular basis. Please also have a look at the other conference hotels in Paris which we are proud to present to you.